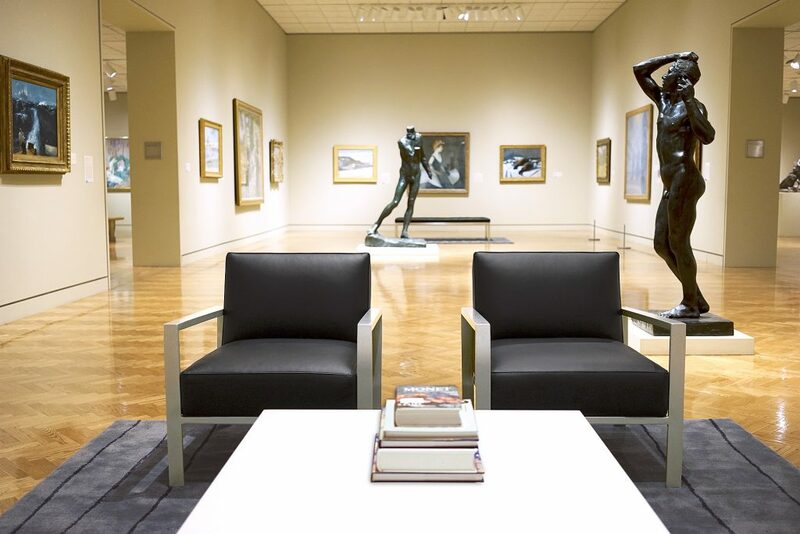 In celebration of its 100th birthday year, the Minneapolis Institute of Art (Mia) planned 52 surprises and asked Room & Board to help with one. A gallery revamp (coined “Mia-Plus”) offers visitors an enhanced experience worthy of putting their feet up. The best way to achieve that? With comfortable, modern seating among the art, which is where we came in! 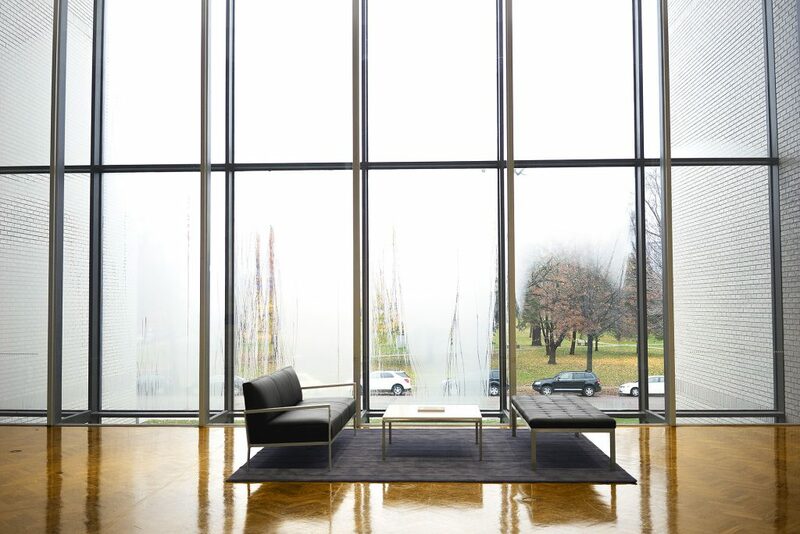 Tim Duffy, a Design Associate with Room & Board’s Business Interiors, worked closely with Matthew Welch, Mia’s deputy director and head curator, to determine the perfect pieces of furniture for the institute. Duffy, whose previous work includes collaborations with retailers like Aveda and Doc Martens, was primed to create a modern setting. 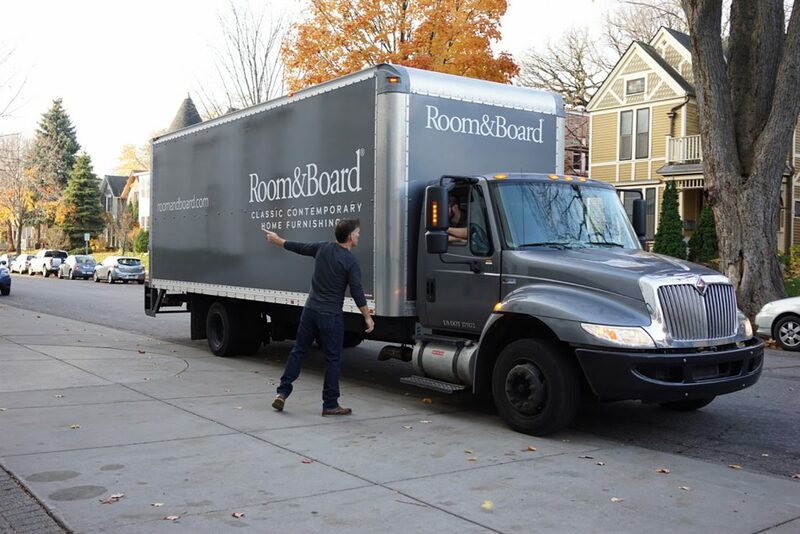 Room & Board makes a special delivery at the Mia. 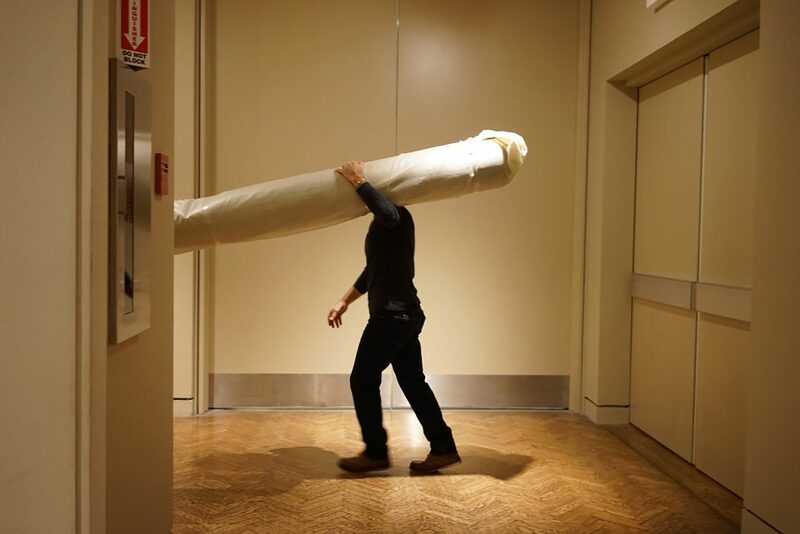 Moving the rugs into the space. 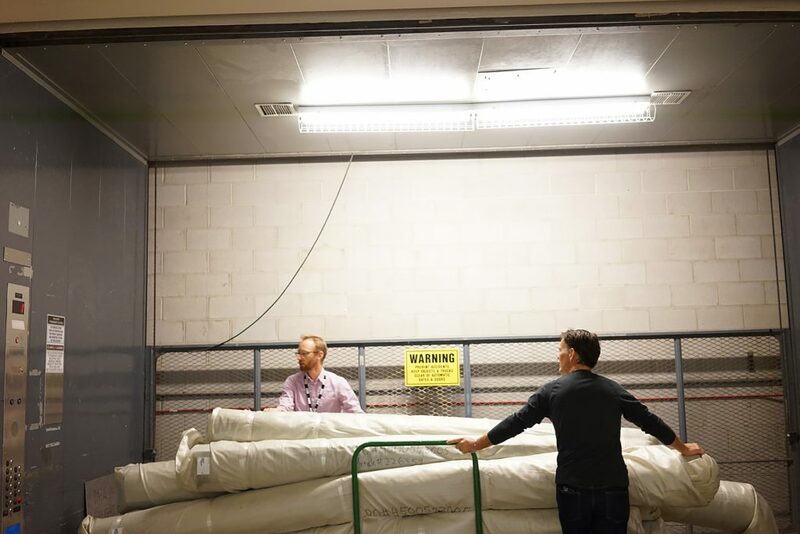 One by one, the rugs go into the gallery. So what goes into designing furniture for public spaces? More than meets the eye. “It’s been my experience that these large, common space areas get a lot of traffic. They get kids and they get families and they get events where there are drinks and food. These areas have to withstand a lot of wear and tear,” Duffy explained. Materials, color choices and room layouts impacted the final decisions. The pieces need to stand the test of time, both physically and aesthetically. Duffy and Welch landed on natural materials like leather and stainless steel to set the foundation. Aidan chairs, Classic coffee table, and Channel rug. For example, the Ravella bench offers comfort with soft, top-grain leather and features a durable stainless steel frame. The simple shape allows patrons to face any direction in a room offering 360-degree views of art. Zinc sofa, Ravella bench, Portica coffee table. 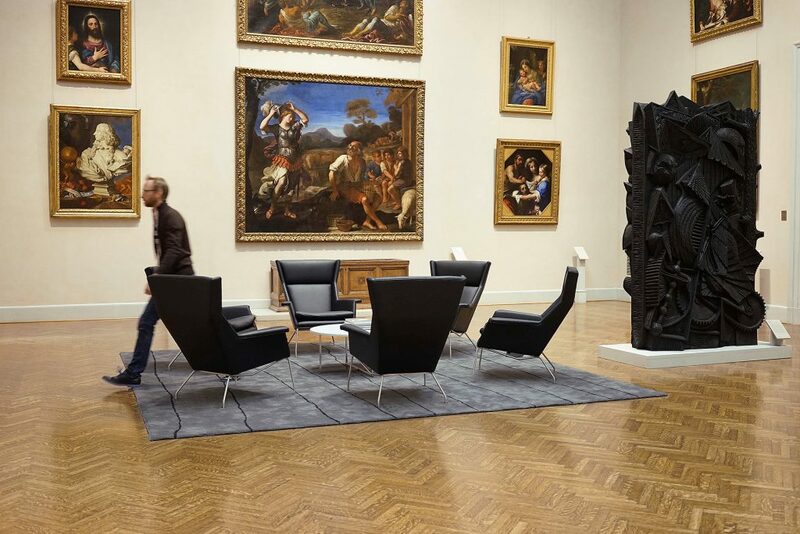 Other designs like our Aidan chairs, Portica coffee tables, and Lex sofas were chosen to create 17 distinct seating areas throughout the galleries. To add warmth, each space was designed to be anchored with a rug. Our Channel rug, made from 100% recycled nylon, is a great solution for these high-traffic areas because it is durable and easy to clean. Each Room & Board piece showcases timeless design and long-wearing, elegant materials for endless mixing and matching. This presents a beautiful solution to accommodate ever-changing events and exhibits at the Institute. If you’re in Minneapolis, make sure to plan a visit. Read more about changes at Mia at MPR.org and watch a video featuring the new gallery settings here. Think of it as your living room, but with better art.